1. Of the Victoria Louise-class protected cruisers, consisting of the Victoria Louise, Hertha, Freya, Hansa and Vineta, preceded by the Kaiserin Augusta and succeeded by the Fürst Bismarck, laid down by the Stettiner Maschinenbau AG Vulkan in 1896, launched on 12 March 1898, commissioned on 29 April 1899, stricken on 6 December 1919 and broken up in 1920. 2. Ernst Fritze (20 April 1850-27 February 1941), promoted to vice admiral on 27 January 1904. 4. 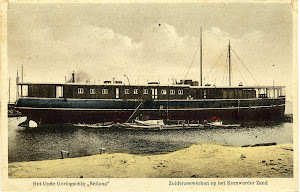 The Jaarboek van de Koninklijke Nederlandsche Zeemacht 1899-1900 confirmed her visiting Tandjong Priok, Dutch East Indies on 18 January and Probolingo, Dutch East Indies between 26-31 January 1900.